Maggie's adventures in the Enchanted Forest continue in the fourth book of a new chapter book series by E.D. Baker! 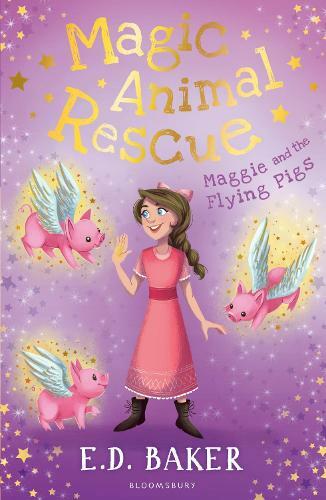 Eight-year-old Maggie has a keen eye for noticing things in the Enchanted Forest that no one else does - like unicorns, griffins and ... flying pigs! Maggie's newest chore at her friend Bob's stable is taking care of flying pigs - but they're not so easy to deal with! Maggie's used to putting up with a lot though, like her stepmother Zelia, who is trying to get Maggie's stepbrother Peter a job at the stable. Peter working with Maggie? Yeah, right! Maybe when pigs fly ... This new black and white illustrated series is perfect for fans of Princess Ponies, Magic Animal Friends and the Emily Windsnap series.